The unparalleled freedom of our century sometimes comes with too many responsibilities and expectations—if an individual believes that something is possible, it is his or her fault if she doesn’t have the perfect ____ (insert aspiration here). This means either guilt or a striving after things that are, if not impossible, pretty difficult. The reality is that we are forced to make very complex choices that generally have at least a few negative consequences. Obsessing over these consequences can be deadly to happiness, because inevitably in a fictitious alternative life everything was perfect. Although this is not primarily a self-help book, I think the implications are powerful: Firstly, there are some decisions that shouldn’t matter, but the number of options out there (for example, when choosing a pair of trousers) is so overwhelming that it begins to seem important. Secondly, there are decisions that do matter, and you can create rules that you apply for all time so that those decisions are made easier. 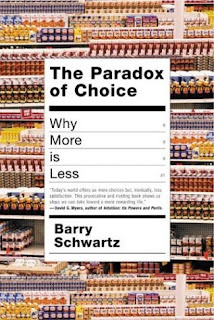 Even though you are choosing to limit your freedom, Schwartz argues that you could avoid some of the effort and regret associated with decisions. Thirdly, whether we like it or not, we are influenced by how we compare things, achievements and people. For example, being aware that you will likely think a product is more affordable if there are far more expensive versions of the product you’re looking for could help you step back and evaluate your decision. I'm reminded of when my parents and I were in Eritrea (Red Sea, borders Ethiopia and Sudan), and the choices were super simple and cheese and chocolate (not together) were about the most awesome things I could imagine. I remember my parents really struggling when they returned to South Africa and there were forty different kinds of every food. It's interesting that it's impossible to recreate the sense of joy I felt when I got chocolate in Eritrea. That said, it's clear that certain limitations, and certain habits, could help fuel a sense of abundance and gratitude. Would love to read your posts about life in Eritrea. Any old photos ? was watching his videos just the other day (for the second time!!!) and have the book in my to-read list! totally agree with the reverse culture shock of having too many choices. Even Tirana has too many choices compared to Laos.